Breast Screening Programme; The breast screening team are now in our area, please see "latest news" for more information. Please complete our Patient Satisfaction Survey 2019 under the heading "have your say"
Please see further information headed "Book your cervical smear" at the right hand side of the page. Bay Health and Care Partners are holding a session in Kendal on 3 April which may be of interest to you or members of your community. Our staff training closure afternoons are now available on the "Opening Hours" tab. Please make a note of these to avoid you having a wasted journey. We would like to advise that Dent surgery will be changing to a TUESDAY with effect from Tuesday 8th January 2019, same time 11:30. Please ring 01539 718191 for an appointment. GP and Nurse appointments are now available in our area, evenings, weekends and bank holidays at Westmorland General, Furness General, Ambleside and Grange health Centres. 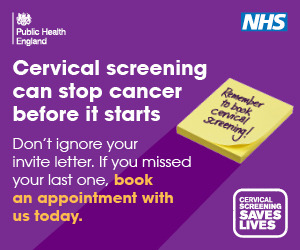 To book an appointment contact us or you can also book by calling 03000 247 247 direct. myGP: you can now order repeat prescriptions via the myGP app as well as make and cancel appointments. Its quick and easy to download and use!! Voluntary Social Car Scheme in Sedbergh, Cumbria County Council are delighted to advise that Julia Skomp has kindly taken over this role. Call Julia on 015396 20305. Friends of Sedbergh Medical Practice are having a coffee morning to raise monies for the practice, funds raised in this way are used to buy equipment for the benefit of the patients, such as the blood pressure machine and the water cooler in reception. Please note the children's nasal flu should be available at the Surgery from Monday 1st October (subject to delivery). Children aged 2 and 3 as at 31/8/18 will be vaccinated at the practice, whilst Reception age to year 5 will be vaccinated at school. Please read our page under "further information" regarding a recent mailshot by Pharmacy2u you before you change your prescription destination! From Thursday 27 Sept baby clinic is changing to mornings at 10-11.30am Clinics will still be held every 2nd and 4th Thursday of each month. When calling the practice, please be aware that the receptionist, on behalf of your GP, may ask for some brief information about the reason for your call, this is to ensure that you are booked into the most appropriate clinic to suit your needs. Our receptionists are here to help and are governed by the NHS code of confidentiality. Our next staff training closure day is Wednesday 12th September from 1pm. The surgery will reopen at 8am (for telephone calls) and the doors at 8:15 on Thursday12th July. 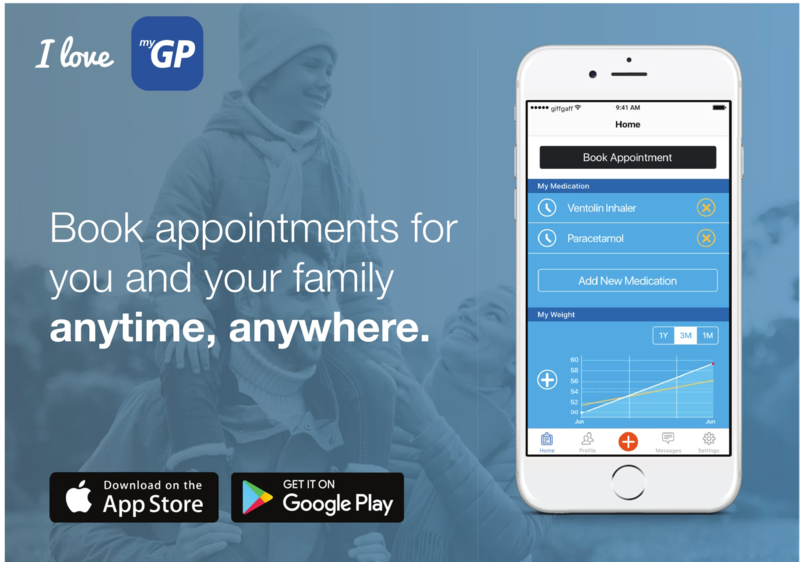 Book appointments for you and your family anytime, anywhere with myGP. Just found out you are pregnant? Please self refer to Maternity Services. See Clinics and Services for further information! A member of the maternity administration team will contact you with 5 working days to arrange your first appointment with your midwife. We regret that Sedbergh Medical Practice are no longer able to book appointments with the midwife. Weekend and evening GP / Health Care Assistant Appointments available by appointment at Westmorland General Hospital or Furness General Hospital at the CHOC (Cumbria Health on Call ) reception. Appointments must be booked by your GP surgery. See poster under "Further Information"
Pick up an application form at Reception or follow the link in Patient On-line in Further information, print the form and present at Reception with photographic ID. New staff training closure dates available: See Opening hours - Staff training closure dates. CHOC (Cumbria Health on Call) are now offering routine GP appointments on a Saturday mornings and evenings at Westmorland General or Furness General with a CHOC GP. Please ask at Reception. If you have recently been referred to see a specialist, see leaflet, "Patient Information regarding your referral". It may save you and your GP time. Please see Latest News regarding the Community Pharmacy Minor Ailment Scheme - Could this be an alternative to an appointment with your GP for minor ailments? Please take a moment to complete our "Friends and Family" test or pick a card up in Reception. Thank you!! Please see above heading for details of the clinics and services that we hold at Sedbergh Medical practice or are held here by other medical providers. See latest news for further information about this new vaccine. Please see Dr Hunt's letter to the Lookaround regarding the open surgery. With Patient Access, you can order your repeat prescriptions on-line from home, work or on the move — wherever you can connect to the internet. What's more, because Patient Access is a 24 hour online service you can do this in your own time, day or night. 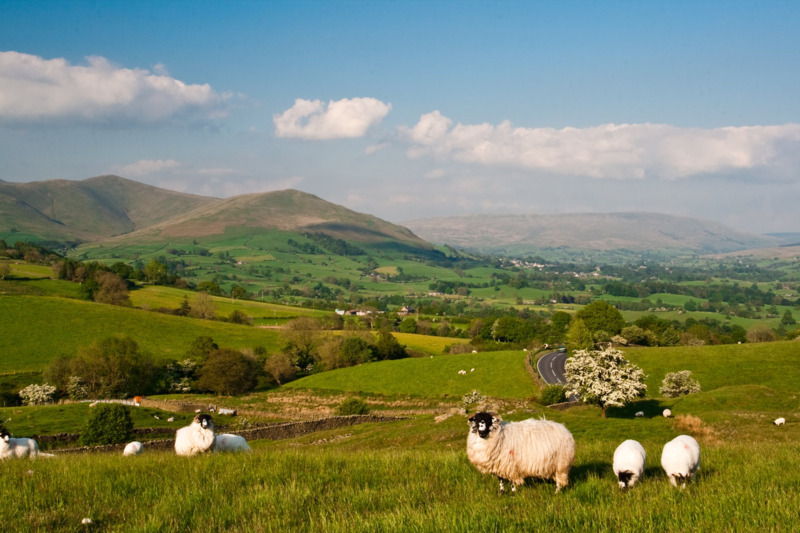 Sedbergh Health Centre covers a geographical area within approximately 10 miles of Sedbergh including Garsdale, Dentdale and Ravenstonedale, see the New Patients page for an area map. We run many clinics for chronic disease care and offer a wide variety of other medical services such as antenatal and postnatal care, minor surgery, travel vaccinations, childhood vaccinations and well-person check-ups.